The quality of washing largely depends on how the dishes will be placed in the dishwasher tray. Not all users know how to properly load their dishwasher to make the wash effective. All it takes is to follow a few simple rules. Put the tableware step by step. Start from the top tray, where you should place glasses and cups. It is important to put them upside down to let the water go down after washing. It does not make sense to place them horizontally since water jets will simply not get inside. Fragile tableware (wine glasses) should be fixed with a special holder. Make sure that they do not touch each other in order to avoid breakages. pepper shakers, salt shakers, etc. Plastic ware goes to the same section. If you put them in the lower rack, they can melt because of the heating elements. All of the above ware should be placed upside down or at an angle. After loading the top tray, make sure that all items are well fixed. Lower rack is designed for medium and large size plates. It is recommended to place them with their upper part directed to the center at a slight angle. Smaller plates should be put in the central part of the rack and the larger ones – at the edges. This kind of arrangement provides the best access of the water streams to the dishes. Spoons, forks, knives and other cutlery need to stay in a special compartment. There must be a gap between them otherwise they will be poorly rinsed. Knives should be put tips down. In some models of dishwashers, this cutlery is stacked horizontally. Such design of the tray contributes to more efficient use of space, and also improves the quality of washing. Large-size dishes (pans, pots, pans, etc.) should be loaded into the lower rack. They should be put at an angle or lay on the side – this way they will not block each other and will be washed as well as possible. Such dishes require special program such as intensive wash or clean and shine wash to completely get rid of dried residues and grease. Wooden items, such as cooking shovels, chopping boards, cups, etc., should not be washed in the dishwasher, as the wood swells after long contact with water. The same applies to ware with wooden handles or other elements made of wood. 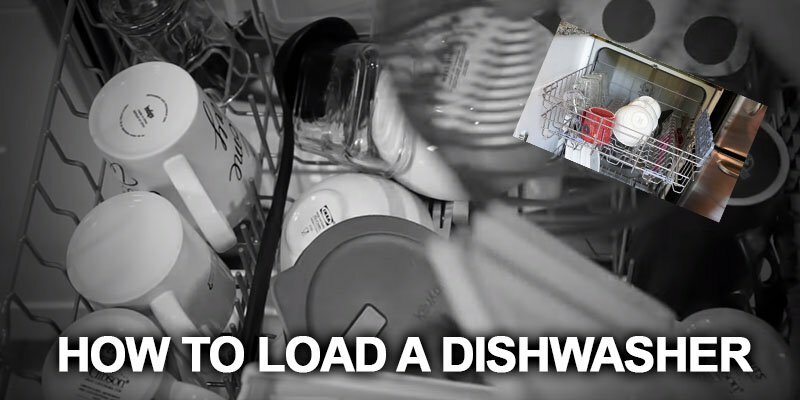 These are the simple rules that show how to load the dishwasher correctly.